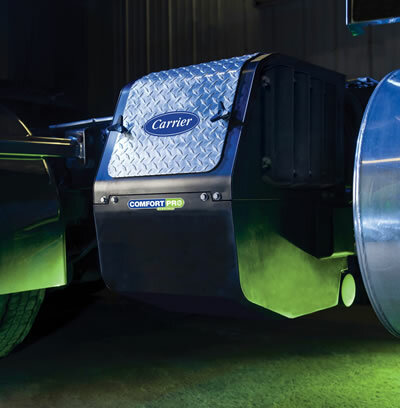 The new ComfortPro® electric auxiliary power unit (APU) from Carrier Transicold provides quiet, emissions-free truck cab cooling while delivering one of the longest run-times in a battery-powered APU. Carrier Transicold is a part of UTC Climate, Controls & Security, a unit of United Technologies Corp. (NYSE: UTX). The ComfortPro electric APU is powered by four Group 31 AGM (absorbent glass mat) batteries that are charged by the truck’s alternator. Thanks to innovative power management technology that maximizes efficiency, the ComfortPro APU provides 7,500 Btu/h of air conditioning for up to 11 hours. With a simpler design than engine-driven APU systems and only a few moving parts, there is less to service with a ComfortPro electric APU – there is no engine-related maintenance such as oil, fuel or air filter changes. As an air conditioning system, the ComfortPro electric model offers an economical path to APU ownership and is relatively easy to install. Carrier Transicold offers several options to expand capabilities for heating, power for hotel loads, shore power connectivity and truck engine preheating, allowing users to customize the unit to meet individual needs. When providing cab climate control and other functions, APUs reduce truck engine idling, helping drivers comply with local and regional anti-idling regulations while saving fuel and reducing wear and tear on their truck engines. The emissions-free performance offered by electric APUs in particular can help drivers and fleets in California, where additional exhaust treatment is generally required for diesel-powered APU applications. Assembled by Carrier Transicold in Athens, Georgia, the new ComfortPro electric APUs are installed and supported by Carrier Transicold’s extensive dealer network. Additional details on ComfortPro electric APUs can be found in a new 12-page brochure, available online from Carrier Transicold at carrier.com/comfortpro-electric. For more information, or to schedule an installation, turn to the experts in Carrier Transicold’s North America dealer network. Carrier Transicold’s new ComfortPro electric APU.